Hello, readers! Are you there? Sorry I've been MIA. As relaxing as being on vacation is, returning to the real world is a hard adjustment! My husband and I had a wonderful time in Florida and ate some amazing food! Obviously I took pictures, so I'll be sure to post them soon. Ok, let's jump in to this recipe: Chocolate Chip Oatmeal Muffins. Y.U.M. Seriously. I was CRAVING chocolate the other night - honestly, I was just craving something sweet. I knew I shouldn't make cupcakes...that's too dangerous! Cookies? Brownies? No. I wanted something that I wouldn't feel too guilty about. Enter muffins! You see, these have rolled oats AND applesauce in them. Healthy, right?! Well, friends, that's what I told myself, so I went ahead and whipped these up. So good and...(you guessed it!)...easy! Enjoy! Set oven to 350 degrees. In a large mixing bowl, cream butter and sugar. Beat in egg. Combine dry ingredients in a separate bowl. Add the dry ingredient mixture alternately with applesauce to the creamed mixture. Stir in oats and chips. 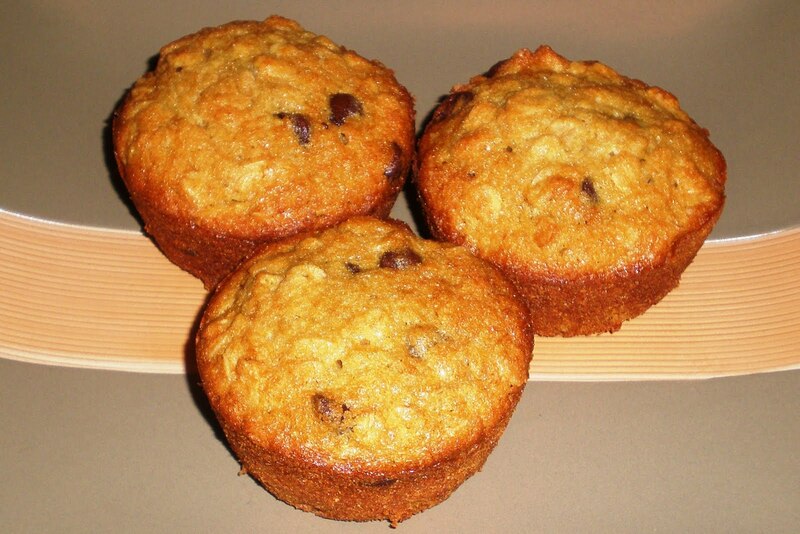 Fill greased or paper-lined muffin tins 3/4 full. Bake for 25 minutes. You must try them - the oatmeal has a great texture!